Presidential succession struggles continue in many nations on the African continent, including the vastly resource rich Democratic Republic of Congo (DRC) and its neighbors to both the east and west. The succession struggles in the DRC’s neighbors are important to the DRC as well, because so many of its neighbors, most of all Rwanda and Uganda, have invaded DRC, leaving millions dead and plundering its resources during the past two decades. President Obama and the U.S. State Department, however, express far more concern with the presidential succession struggle in Burundi than with those in Uganda and Rwanda, or in the Republic of Congo and the Democratic Republic of the Congo itself. President Obama has even excluded Burundi fromt the African Growth and Opportunity Act trade agreement. Reuters reports that the ruling party led by President Joseph Kabila in the Democratic Republic of Congo says that elections must be delayed up to four years until a national census and revision of the voter rolls can be completed. Dozens of Congolese have been killed or imprisoned for protesting against Kabila’s attempt to cling to power.In the Republic of the Congo, the Democratic Republic of Congo’s neighbor to the west, a referendum that would allow President Sassou Nguesso to stand for a third term passed this week with a voter turnout that Reuters described as a trickle in the country’s capital, after the opposition encouraged a boycott of the polls. The Republic of Congo’s opposition also held a commemoration for the 17 people they say were killed during national demonstrations earlier this month; President Nguesso’s party says that only four were killed. In Uganda, one of the Democratic Republic of the Congo’s neighbors to the east, President Yoweri Museveni doesn’t need to overcome term limits because Uganda’s Parliament abolished them in 2005. He has already announced that he will run again in 2016, his 30th year in power. Museveni’s Parliament has also passed a “Public Order Management Bill,” which makes it illegal for more than three people to lawfully assemble in public. Earlier this week in Rwanda, another of the Democratic Republic of the Congo’s neighbors to the east, the lower house of Parliament unanimously passed a constitutional amendment that would allow President Kagame to remain in office until the year 2034. No one reports any opposition expected in the upper house or the succeeding public referendum. Rwandan American attorney Charles Kambanda writes that the constitutional amendment makes extraordinary provisions to enable Kagame alone to hang on to power and making him far more than equal to other Rwandan citizens before the law. Kambanda also says that this is not an “amendment to the constitution,” but a constitutional coup. In Burundi, Rwanda’s neighbor and another of the Democratic Republic of the Congo’s neighbors to the east, President Nkurunziza claimed the right to be elected twice by universal suffrage and won the election, as Rwanda’s President Kagame did in 2010 and DR Congo’s President Kabila did in 2011. Nkurunziza’s right to run again was confirmed by Burundi’s highest court. After a failed May coup attempt in Burundi, the coup plotters took up arms against the government. Violence has continued in the capital Bujumbura, with police, government officials, protestors and opposition leaders all suffering casualties reportedly totalling as high as 200. Burundian officials accused Rwanda of backing the coup plotters after clashes on the Rwandan Burundian border. 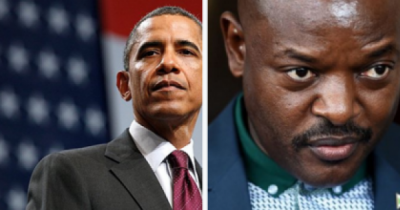 Neither President Obama nor the U.S. State Department protested Kagame or Kabila’s second election by universal suffrage, but both have adamantly protested Nkurunziza’s. The Black Star News asked the U.S. State Department to comment on the constitutional amendment that will allow Kagame to serve until the year 2034. State’s press office promised a response as yet unreceived, but, in response to past inquiries, State has gone on record in opposition to another term for Kagame. Many Congolese say that another term for Kagame could be catastrophic for them as well.